Want to spruce up your Artist Shop? Now you can feature your products in a whole new way by adding custom product photos to your shop! 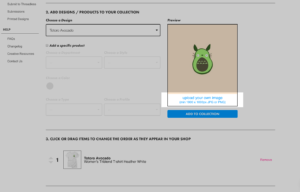 With this new feature, you can add photos to your homepage, as well as to any collections in your shop. 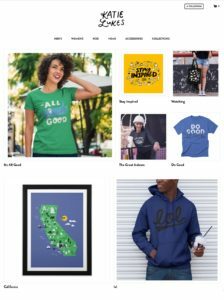 An example of how our artist Katie Lukes’ shop homepage would look with lifestyle photos! It’s no secret that when it comes to selling products, images can seriously help boost sales. One analysis of 5,000 e-mail campaigns found that the ones that used images got a 42% higher click rate than those without images. Designs and flat mock-ups can only tell someone so much about your product; photos give your shop a whole new look and appeal, but more importantly they build trust in your customers by showing your product in action. We’ve all seen (or been) that person in a store who has to touch every item in the store; you can’t do that while online shopping. so photos are a great way for customers to see your product IRL and to see that it’s worth their money! WHERE WILL THE IMAGES SHOW UP? Your product photos can be added to any of your collection pages, which includes your homepage. While they won’t appear on the actual product page, having them on your homepage and each collection page is like a visual foot-in-the-door to pique a customer’s interest. Top row: Elebea’s Artist Shop product (taken by one of our staff on her phone! 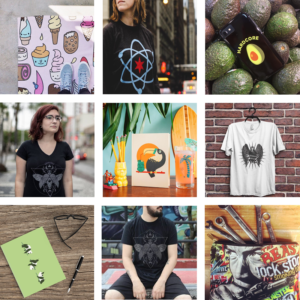 ), March for Science Chicago, and Art by Jaime | Middle row: Deniart Clothing, Katie Lukes (taken by our photographer featuring Katie’s designs! ), and The Braven Design | Bottom row: Agriimony, Deniart Clothing, and In Adon We Trust. ✔️ Do you have a killer cover image? ✔️ Have you added an “About” page? ✔️ Have you added these new products to your shop? How about the ‘Classic Tee’? ✔️ Is your keyword game strong? ✔️ Have you created some cool collections? ✔️ And of course, have you added custom photos to your collections? 8 responses to Add Custom Photos to Your Artist Shop! The way arrange and decorate the photo has an important role in attracting the customer, so the keep shopper should note take care for the homepage. Great feature! We could maybe have a little photo credit area to fill as an option as many artists collaborate to make some photos instead of using always paid ones. This is great, but it would also be nice to be able to add custom photos on the product page. Next post Introducing 5 New Artist Shops Products!